A common cause of low back and leg pain is lumbar spinal stenosis. 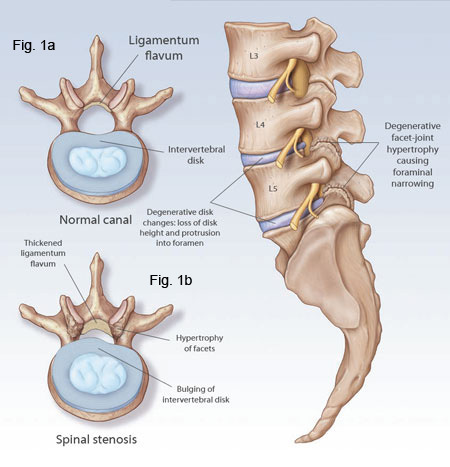 Spinal stenosis is caused by a narrowing in the spinal canal. This narrowing may be caused by degeneration/arthritis, mechanical problems or congenital abnormalities. Stenosis may or may not result in low-back pain, limping and a lack of feeling in the legs. Degeneration may exist for years without causing pain or discomfort, but a fall or an accident can trigger characteristic stenotic pain. Spinal stenosis most often occurs in adults over 60 years of age. There are numerous factors which can cause stenosis; such as thickened ligaments, expanding infection, developmental abnormalities, degenerative changes, vertebral fractures or dislocations, or a spinal cord tumor. Spinal stenosis can also result from long-term steroid use. Other conditions, such as a herniated disc, can mimic stenosis. Approximately 75% of cases of spinal stenosis occur in the lumbar spine (low back), which is called lumbar spinal stenosis. This can also affect the sciatic nerve, which runs along the back of the leg. Spinal stenosis can usually be diagnosed with a physical examination, imaging tests and a review of the patient’s medical history. Your doctor will evaluate what symptoms are present, what makes them better or worse, and how long they have been present. A physical examination is fundamental for determining how severe the condition is, and whether or not it is causing weakness or numbness in certain parts of the body. A neurological examination can determine if abnormalities in the strength and sensation of particular parts of the body may be indicative of a pinched nerve. The examination is also used to rule out other conditions, such as those associated with hip and knee arthritis or diabetes. In many mild and moderate cases of stenosis, non-invasive conservative care, such as chiropractic treatment, can help lessen pain and discomfort, maintain joint mobility and allow the patient to maintain a reasonably normal lifestyle. Home exercises are recommended, four to five times a week, as part of the healing process. Especially helpful are stretching and strengthening of the lower back and stomach muscles and increasing muscle strength. Effective exercises include bicycle riding and lying on your side and grasping the knees with your arms and focusing on flexing the spine in a forward position. When the patient loses bowel or bladder control, suffers from intolerable leg pain and/or has progressive loss of function, surgery may be recommended. Recent studies have shown that conservative care, such as chiropractic, is just as effective as surgery in reducing the symptoms of stenosis. Ultimately, stenosis is a chronic condition that cannot be “cured.” The good news is that symptoms can be reduced, your health can be improved and that improvement can be maintained over the long term. Patients who work with a health care provider, such as a doctor of chiropractic, can reduce their symptoms and improve their overall quality of life.